Hey everyone, I'm sure you're all hard at work grinding out your ranked games for the imminent close of Season 7 (generally around November the past few years), so let's not beat around the bush this patch. There are some champions that are better suited for the world stage and competitive play, but you're here to gain some sick LP for your solo queue games. It's a world where it's every man for himself, and you don't have time to convince your braindead teammates peeling is better than tower diving. Anyway, let's jump right in! Anivia [God Tier Mid] - Anivia's great offensively, but it's really her ability to play from behind that allows her to be a god tier mid-laner in solo queue. Enemy players have a tough time coordinating a good dive, and Anivia's the queen of turtling and causing misplays. As a result, even though you may not win your lane every game, Anivia makes it near impossible for enemy teams to siege effectively while your team can farm freely. This allows you to win games even if all your lanes lose. Azir [Tier 1 Mid] - The Azir buffs were actually quite good for the emperor, and if you spent a lot of time practicing him in the past, you might want to pick him up again as a mid-laner. He's by no means "freelo", but he's more than worth his weight in team fights and as a lane bully (provided you get blue buff). Draven [Tier 1 Marksman] - When it comes to organized competitive play, Draven's never really been a superstar since there are obvious counters to his kit and he's a straight-forward time of champion. However, in solo queue a good Draven is near unstoppable, especially with Tristana consistently being banned. If you see a Tristana ban and you happen to be a Draven main, then make sure it's time to Draaaaaaaven! Janna [God Tier Support] - Janna's status as a passive shield support are somewhat over, but she can still work in that role if necessary. Meanwhile, her ability to be an offensive support was greatly increased, resulting in an extremely versatile support that can play whatever style she enjoys. Jayce [God Tier Top] - Full lethality Jayce top is currently broken and can bully/roam his way to the top of the ladder with ease. 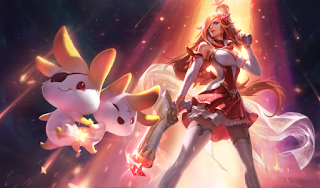 If you're a top laner, this one's certainly worth putting in your arsenal. Lucian [Tier 2 Marksman] - Honestly, Lucian in his current state is probably better suited for Tier 3, but putting him among the likes of those picks simply isn't fair. He's still viable in the current meta, but his main problem is that all the marksmen that are currently picked are excellent lane bullies, and most players understand the level 2 power spike. Meanwhile, his late game suffers from his short range and the fact that peel supports make it difficult for him to burst an enemy marksman with his triple reset combo. Malzahar [God Tier Mid] - When it comes to brain-dead mid lane champions that can get you free elo, Malzahar fits the bill perfectly. He's got semi-passive farm + mana regeneration and a point and click suppression that kills tanks just as well as squishies. Choices are almost negligible, and the speed that enemy players hit their QSS (if they buy one) is more than enough time for your team to jump the target. Miss Fortune [God Tier Marksman] - Miss Fortune is arguably the most underrated marksman in the game right now. Her last-hitting is a breeze with her passive love tap, and she can easily just stay even in lane until she picks up her first lethality item. After that, if you hit a single double-up in lane you've basically won the lane and can pick up an extra 10~15 CS advantage. Meanwhile, once team fights break out she can instantly proc full Black Cleaver stacks + Executioner's Calling stacks on the entire enemy team. This synergizes incredibly well with the large number of attack damage based mid/top/junglers in the meta right now. Quinn [Tier 1 Top] - Quinn top is another one of those solo queue monstrosities that you hope never becomes popular. Lethality is extremely good right now, and when that happens, so is Quinn. The latest buff to Edge of Night means enemy players will have some high difficulty stopping her from flying in from the side and instantly deleting key targets. Additionally, her roam power during the game is essentially Pantheon on steroids post-six. Renekton [Tier 2 Top] - This croc has been a fan favorite for a very long time. His ability to snowball through top is excellent 1v1 against melee champions, but his team fights take some finnesse as his main initiation technique is face-tanking. Although Renekton mains understand his damage output and durability, it's hard to convince your team that when you go in it's time for them to go in as well. This results in reduced teamfight effectiveness in solo queue. I'd avoid him despite how good he feels in lane. Xin Zhao [Tier 1 Jungle] - A lot of players are putting down Xin Zhao, but he doesn't feel like he's in an awful place right now. In fact, he does seem stronger than he was pre-patch and his numbers show it even with the increased play rate. He's a bit more complex to play, but not so much that it makes him difficult.